HIstory | Manhattan Scientifics Inc. The story of Manhattan Scientifics begins with the holographic research component of the Company. In the late 1980s the Microelectronics & Computer Corporation (MCC), invested approximately $25 million in holographic data storage research. The research produced no conclusive results. However, Manhattan Scientifics CEO, Marvin Maslow, fascinated by the potential of holographic storage, was reluctant to give up, believing that eventually, its time would come. He decided a more intense and focused research effort, with new expertise, might eventually produce the long-sought results. Meanwhile, in August 1997 Maslow visited Los Alamos National Laboratory (LANL) to investigate new technologies with commercialization potential. LANL's Civilian Industrial Technology Program Office, functioning in the capacity of matchmaker, introduced Maslow to Robert Hockaday, a LANL physicist who had taken entrepreneurial leave-of-absence to refine a patented MicroFuel Cell technology he had been developing with his own funds. Maslow recognized that the holographic project might benefit from the expertise of Los Alamos National Laboratory materials science experts, and, combined with the MicroFuel Cell technology, would be a solid foundation for a technology incubator to commercialize leading-edge technologies. Knowing that fledgling companies can flounder during the standard capitalization process of protracted analysis and negotiations, and that getting a new technology to market quickly is crucial to success, Maslow deployed what he calls a "guerrilla financing" strategy. In a period of approximately four months he formed Manhattan Scientifics, Inc., raised the capital Hockaday estimated he needed to begin intensive development of a working prototype, and took the Company public on January 9, 1998 by means of a reverse merger. Manhattan Scientifics introduced several potential solutions to the world wide alternative energy need as it relates to personal, 2-wheel transportation, particularly in Asia. One example is the companies development of the award winning NovArs hydrogen powered fuel cell engine. Light weight and portable, it may be ideal to provide a "green" inexpensive system to drive scooters, bicycles, power tools, portable electronics, wheel chairs, golf carts, and home emergency power. 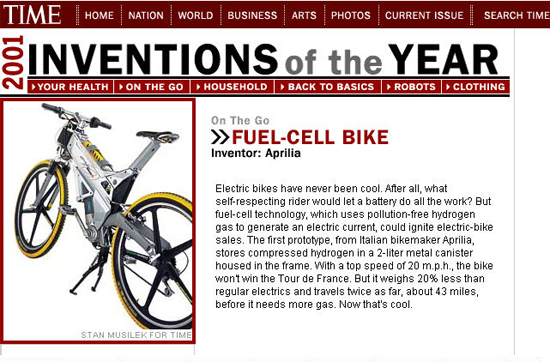 The company won Time Magazine "Invention of the Year" award for its fuel cell Aprilia concept bicycle engine in 2001. To date a world - wide hydrogen infrastructure has not materialized. Manhattan Scientifics provided seed funding to former Los Alamos National Laboratory scientist Robert Hockaday, who has developed a flat printed fuel cell designed to provide an "always on" energy source to power micro-electronics such as cellular telephones and pagers. Manhattan Scientifics owns the worldwide right to the patented technology. To date, the micro fuel cell has not been commercialized. Efficient, lightweight, portable power for larger applications such as laptop computers, power tools and mobility devices. Environmentally safe, AlwaysOn portable power for small electronics, such as pagers and cellular phones powered by methanol and water. The following is a list of historical articles about Manhattan Scientifics.